Bruce Springsteen: A Universal, Original 'Wrecking Ball' Springsteen told Rolling Stone that Wrecking Ball is "as direct a record as I ever made." It's also one of his most stylistically diverse, including elements of gospel and hip-hop as well as rock and the blues. Rock critic Ken Tucker says the music "testifies to a bottomless ingenuity, invention and exhilaration." It's not difficult to guess what the over-arching theme might be on an album Bruce Springsteen characterizes as being "as direct as any I ever made." The title song from Wrecking Ball is one he wrote a few years ago to commemorate the demolition of Giants Stadium in New Jersey. It was written from the point of view of the stadium, but in its new context, the wrecking ball is a symbol of the implacable forces that have wrecked the economy for millions of people. Government policy, banks and politicians are among those wielding the wrecking ball that, to Springsteen's way of thinking, is putting dents in, if not shattering, many people's souls. In "Jack of All Trades," Springsteen sings in the character of a kind of universal laborer, eager for work yet bitter — there's a verse about how the "banker man grows fat, working man grows thin / It's all happened before, and it'll happen again." But the song takes a surprising turn at the end; replacing resignation is rebellion, with the narrator saying that if he had a gun, he'd shoot those who exploit him. The song is something of a purposeful mess. The point of view shifts constantly, from that of a man begging for a job to one addressing a lover with the assurance, "Honey, we'll be all right," back to that guy whose despair has moved him to violence. It's all underscored by a guitar line from Rage Against the Machine's Tom Morello. Ultimately, the song is an unruly creation that works because of the music, which is rich with a ripe melancholy and a subtly relentless pace that moves you toward that violence before you realize what's being sung. Indeed, it's the music you have to heed before the lyrics throughout Wrecking Ball. "Death to My Hometown," a kind of bleak sequel to Springsteen's Born in the U.S.A. song "My Hometown," is an Irish jig that moves with jaunty aggressiveness. The album's first single, "We Take Care of Our Own," is a full-bore blast of sound that could easily be the kick-off song on any given night of the tour Springsteen and his E Street Band are commencing with the release of this album. 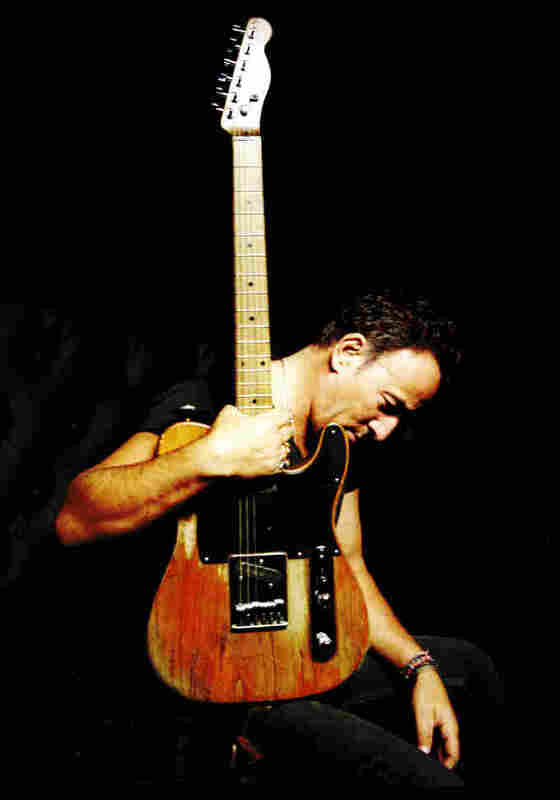 But Springsteen works with co-producer Ron Aniello to create something less monolithic than an E Street Band record; it's a Springsteen album made with a wide variety of musicians and technology. Tape loops and samples are deployed to make sonic collages. In "Rocky Ground," Springsteen has even written a rap verse. When I first got a finished CD of Wrecking Ball, I looked quickly at the credits for "Rocky Ground" and thought it read, "featured vocal by Michael Moore." Turns out it was gospel singer Michelle Moore in that song, but there's so much sociopolitical content on Wrecking Ball that it wouldn't have surprised me at all if The Boss had cajoled the agitprop filmmaker into howling a verse about, say, the present state of labor unions. Still, one of the ways to miss the most significant achievements of Wrecking Ball is to concentrate on the lyrics and not appreciate what Springsteen is doing with the music here. It's a marvelously diverse creation, drawing upon and uniting so many American periods and styles of popular music that it creates a very effective tension: The lyrics may speak of despair, but the music testifies to bottomless ingenuity, invention and, yes, exhilaration.